>Dr. Michael Oh published the full length of this article on his blog. What an incredible story! 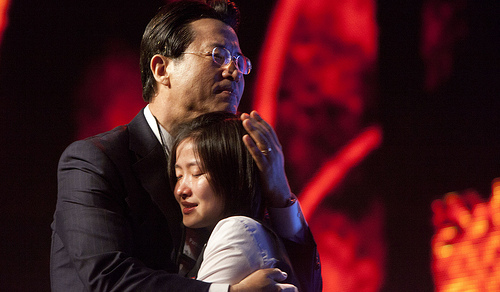 On the second night of theThird Lausanne Congress taking place in Cape Town, South Africa, an 18 year-old girl from North Korea shared her story. She was born into a wealthy family, her father an assistant to the North Korean leader, Kim Jong II. Eventually her father’s political fortunes shifted, and after being politically persecuted by the North Korean government, he, his wife, and his daughter escaped to China. After three years he was able to return to China where he was briefly reunited with his daughter. Soon after, however, he gathered Bibles having resolved to return to North Korea to share Christ among that hopeless people. He was given the opportunity to go to South Korea, but he turned them down. In 2006 he was discovered by the North Korean government and was arrested. There has since been no word from him. In all probability he has been shot to death publicly for treason. I look back over my short life and see God’s hand everywhere. Six years in North Korea, 11 years in China, and a time of being in South Korea. Everything that I experienced and love, I want to give it all to God and use my life for His kingdom. I hope to honor my father and bring glory to my heavenly Father by serving God with my whole heart. I believe God’s heart cries out for the lost people of North Korea. I humbly ask you, my brothers and sisters, to have the same heart of God. Please pray that the same light of God’s grace and mercy that reached my father and my mother and now me will one day come down upon the people of North Korea… my people.